Many of us have been, or know someone who has been, touched by cancer. It can be a very emotional and difficult time in people’s lives, and for the family around that person almost as much as the one going through it. That’s even more the case when a child is ill. Many good charities fund research into the prevention and cure of cancer, and many offer support and encouragement to its sufferers, but Children with Cancer UK is dedicated to fighting childhood cancer: the biggest killer of children in this country. To try and support children and their families, and to help save more children in the future, I am taking on a charity mountain bike challenge. The Crossing covers 200 miles in three days, literally crossing the spine of the UK from Whitehaven on the west coast to Scarborough on the east. On the way I’ll be climbing the hills, fording the valleys and battling out the unpredictable weather of the Lake District, Yorkshire Dales and North Yorkshire Moors. It’ll be an amazing and challenging experience, demanding three long days of hard off-road riding in some of the UK’s most rugged scenery. 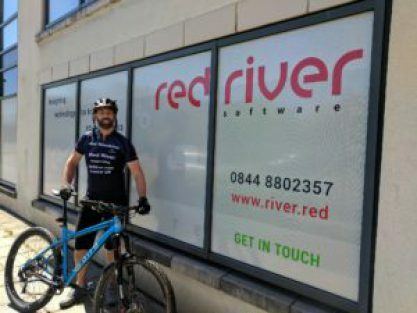 Red River has generously agreed to sponsor me for the event, and if you’d like to contribute you can do so – with my thanks – via my fundraising page. I’ll try to share pictures and updates from the event via our Twitter account, and there’ll be an update next week to let you know how I got on. I can’t wait to get started: it’s both an exciting and daunting prospect.